Zoo With Roy: Wes Chamberlain has a Book and You Should Totally Buy It. NOW. Wes Chamberlain has a Book and You Should Totally Buy It. NOW. I received the above message yesterday from Mr. Wes Chamberlain, he of the 1990-1994 Philadelphia Phillies, to inform me (and you, presumably) about his newly (self-?) published (Kindle only?) 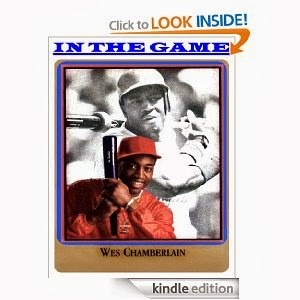 biography/memoir, "IN THE GAME (Volume 1)." VOLUME 1. That means there are more volumes in the works! And it's only $19.99! That's LESS THAN $.11/PAGE, people. This book is to motivate, mentor and to be a testament to every one who reads it, so that you may be encouraged when things aren't going well with you or as planned in your life. If it can happen for me, why not you? We all need each other to succeed and to become successful; the proof is in the pudding. While growing up in the windy city of Chicago, you are presented with immeasurable opportunities on what you dream of becoming in life. From the Politicians to the Gangsters that operates the city. You had to learn how to improvise, adapt, and overcome every situation that you're challenged with at an early age. The Ida B. Wells was a community full of role models, which had every type of life, lesswons and influences to dream of whar and not to be when you grew up. Just like our amendments, the act of making such a change or alteration, if you don't like your situation, do something about it, to make it better. My question to you is simple. Is being a product of an extinct neighborhood good or bad? We all have our own opinions, and were all entitled to them. The purpose of telling my life story is to give to someone else, that which was given unto me. Freely I've recieved, so freely I shall give also. What type of products is your life producing? Some of us have many talents, (the jack of all trades) but still have not mastered any of them. We have to become certified with one talent at least, before we can administrate with the other talents. Yes. YES. A thousand times, yes. Do yourself a solid and grab a copy (Kindle only, I think?) here. P.S. If any of my readers would like to purchase this and write a book report on it, I'll consider publishing it.